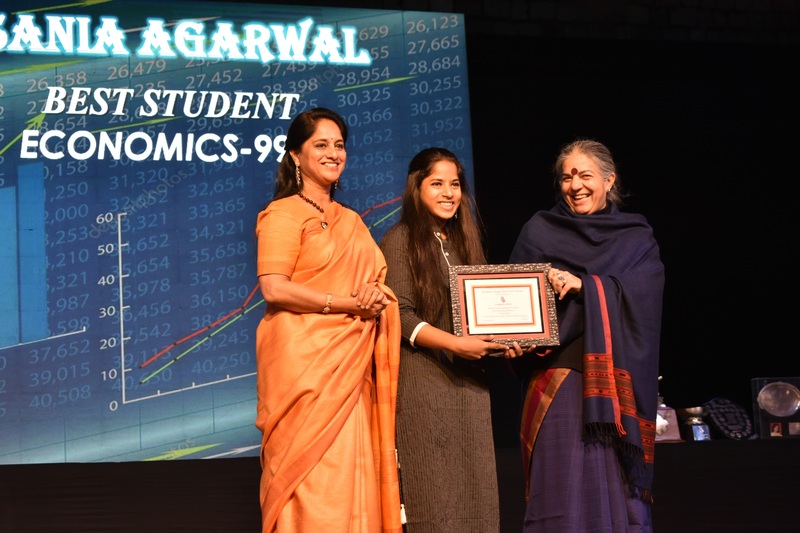 Student achievers of the Maharani Gayatri Devi Girls’ School (MGD) were felicitated at the 75th Senior School Annual Function and Prize Giving Ceremony. The chief guest on the occasion was noted social activist, environmentalist and author, Dr. Vandana Shiva. The programme began with a welcome address delivered by President, MGD, Rani Vidya Devi who also introduced the Chief Guest for the evening. This was followed by the School’s Annual Report which was delivered by the Principal, Mrs. Archana S. Mankotia in which the annual achievements of the school were outlined. The event was also attended by Administrator, Col. Surendra Sangwan, members of the Board of Governors and MGD Guild as well as parents. Ms. Vandana Shiva in her address said that the students have showcased diversity and creativity over what they have learned during their classes and projected it with their own uniqueness. In the next 10 years the world will undergo a dynamic change. This change will be based on legacy and heritage, which the girls have beautifully exhibited during their performance. Among the awardees were the meritorious students who had excelled in the CBSE examinations. Notable among these was Priyanka Kedia who topped the school with 97.2% in humanities stream. House awards were also announced in which the trophy for the All Round Best House was bagged by Madame Curie House. The programme also witnessed mesmerising performance of a dance drama- ‘Ye Aasman ki Udaan’ featuring participation of over 500 students. The play celebrated the strength of women across the centuries and left the audience spellbound. The school orchestra which included students who performed on various musical instruments like – Violin, Jazz Drums, Guitar, Sitar, Swarmandal, Tabla and vocals. There was also a rendition in Raag Hansdhwani.